There are benefits and drawbacks to growing indoors. When it comes to pests, the upside is that indoor grow spaces can be sealed off relatively effectively from the outside worldPest infestations are a grower’s worst nightmare thanks to the stunted growth and crop damage that they bring. But by understanding the types of pests that an indoor crop is most likely to fall victim to, and the principles of effective pest management, it is possible to keep indoor cannabis gardens healthy, even in the face of the peskiest pests. Pests, come in two main varieties – insects and fungi. Both can be extremely problematic and can severely damage an entire indoor crop in a very short amount of time if left unchecked. Insect pests come in a wide variety, including aphids, whiteflies, thrips, gnats, and mites (which are technically arachnids!) All insect pests cause damage in essentially the same way – by sucking the juices out of plants. As a result, the damage done by many insect pests often produces symptoms similar to under-watering. Infestations of these pests can be difficult to notice if a grower isn’t paying careful attention. While some – like gnats and aphids – can be seen with the naked eye and are relatively easy to spot, others – like mites – are microscopic, and can only be detected with the naked eye by the symptoms they produce. In addition to the damage these pests do by feeding on the juices in plants, they can also act as carriers for disease, making it absolutely imperative that they’re dealt with as soon as an infestation is identified. Fungus is the other type of pest. that commonly attackplants. Fungal infections can spread quickly, destroying plants, making them unsafe for consumption, and putting entire gardens at risk. The most common fungal problem that the average grower is likely to be familiar with is botrytis cinereal – or bud rot. Bud rot affects many different types of plants in addition to cannabis but is most common in wine grapes and strawberries. This grey mold starts out deep inside the bud core and rots the plant from the inside out, making it not only extremely damaging but extremely hard to detect in its earliest stages. Once it sets in, the infected areas of the plant have to be quickly removed. Another enormously destructive fungal pest is powdery mildew. This white, powdery-looking fungal disease can be caused by many different types of fungi, and slows plant growth or, in severe cases, can kill plants outright. As the mildew reproduces, the spores can become airborne, causing the fungus to spread both within the infected plant and also to other uninfected plants. As a result, powdery mildew can spread extremely quickly and is arguably the most severe thread faced by cannabis plants. Regardless of the type of disease or infestation, once a problematic level of pest activity has been identified, action must be taken immediately to ensure that the damage is isolated as much as possible and the entire crop doesn’t suffer. The solution to pest infestations is integrated pest management, or IPM. IPM is used across all types of growing, from large agricultural applications to the smallest home gardens. The goal of IPM is to use current knowledge of pest life cycles and environmental requirements to minimize pest damage in the most economically friendly and minimally hazardous ways possible1. IPM follows a four-tiered approach; setting the threshold for acceptable pest levels, monitoring and identifying pest populations, applying preventative measures to stop infestations before they happen, and deploying pest control measures to stop infestations and minimize damage2. As the old maxim says, an ounce of prevention is worth a pound of cure, and that holds true when it comes to protecting cannabis plants from pests. The primary method of prevention for indoor gardens is keeping them sealed off and clean so that pests can’t be introduced in the first place. One of the most common and most effective ways of sealing off a garden from the outside environment is surrounding it with mylar. Mylar is a stretched polyester film that can be easily applied around a garden in sheets, and its properties make it an incredibly effective environmental barrier. Once a garden has been sealed off from the outside environment, the only way pests can get in is by being carried in. That can be avoided by treating the garden as a clean room and ensuring that every person and object that enters it has been sanitized. Growers should wear clean clothing every time they interact with the garden, and tools and equipment should be cleaned with alcohol to kill any sneaky pests that might be waiting to catch a ride. Other prevention methods that can be applied include properly controlling humidity, keeping standing water to a minimum, quickly disposing of garbage and other pest attractants, and properly sealing off the areas outside of the garden by screening-off windows and properly sealing doors and other potential points of entry. No prevention method is 100% effective, and eventually, it’s likely that pests will find a way in to even the most well-protected indoor garden. Organisms getting into a garden isn’t necessarily a bad thing, and some can even be beneficial, but if harmful pests turn up at a level exceeding the allowable threshold, action must be taken immediately. The key to good IPM is that pest control methods should always be as minimally harmful as possible. That means chemicals should only be used as a last resort, and if they are applied, the least harmful options should be attempted first. One great non-chemical pest control tactic that can be successfully applied to indoor cannabis gardens is companion planting. Companion planting keeps pests in check by mixing complementary plants in among a garden’s cannabis plants to create a tiny, diverse ecosystem that naturally repels insects or provides them with more attractive feeding options. For instance, herbs like basil, dill, and coriander can be effectively used to repel pests like aphids and spider mites. Companion planting is a great option for indoor growers since many of the most effective companion plants are relatively compact. One less ideal non-chemical option is introducing beneficial insects to indoor garden environments to help control pests. Ladybugs, while adorable, are natural killing machines when it comes to pests like mealybugs and aphids. 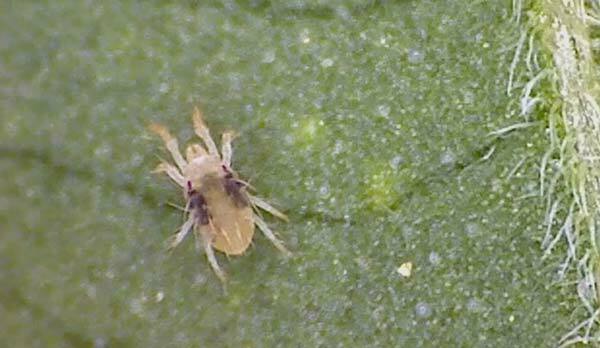 There are also a number of types of predatory mites that pose no threat to cannabis plants but can decimate pest-mite populations. Predatory insects are effective, but the idea of introducing more bugs to an indoor garden – especially one in the grower’s home – isn’t normally an appealing thought. If all else fails and chemicals treatment is needed, there are a variety of organic biological treatments that can be applied using foliar sprays that will both destroy existing pest populations and also help prevent future infestations. Since these organic sprays are far less harmful to the environment than non-organic chemical sprays, good integrated pest management principles suggest they should be tried first before moving to more harmful non-organic chemicals. While it’s effectively impossible to keep pests completely at bay, by understanding the different types that exist, how they cause damage, and the options available to keep them under control, growers can minimize the negative impacts of their eventual run-ins with cannabis pests. The principles of integrated pest management are particularly beneficial, both in pre-emptively combating infestations and in eliminating them if and when they do occur. Those principles can be applied to any grow space, and no garden is too small to benefit from IPM. The reality is that anywhere there are plants, there are pests. The key is to acknowledge that fact and to take a proactive, responsible approach to plant-health management. Doing so will ensure minimized costs, maximum crop growth, and the best end product possible.